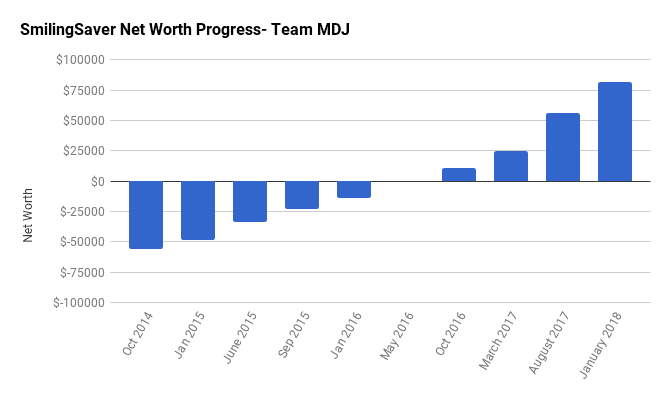 Welcome to the Million Dollar Journey January 2018 Net Worth Update – Team MDJ edition. A select group of readers were selected to be part of Team MDJ which was conceived after the million dollar net worth milestone was achieved in June 2014. SmilingSaver was selected as a team member and will post net worth updates on a regular basis. Here is more about him. Goals: New Goal: Have net worth equal to the value of the primary residence Oct 2021. Notes: Married in May 2015. Wife graduated from school with a second degree in May 2015. Immigrated to Canada 16 years ago (full story here). Debt free May 2016. First of all, since it is my first update of the year I wish everyone happy new year. Looking back at 2017, it was kind of a turning point for us. New city and new life. With the biking, gym, and eating fresh veggies I was also able to lose over 15kg (great side bonus). We just signed another one year lease for our apartment that also happens to be close to work. The price we pay for rent is way cheaper than buying in this market. So it is a great find. The more we look at Vancouver prices the less it makes sense for us to step into this housing market. Overall we are still putting aside more than 50% of our income without much trouble. We now have over $50,000 in our RRSPs: $25,000 in my account and $25,000 in my wife’s account. This was one of our goals for 2017 that we were able to achieve. The reason for the $50,000 number is that it is exactly what is required for the first time buyers. Even though we might not use it now, I feel great having that starting point. Our next step is to work more towards maxing our TFSAs as it provides better flexibility. Darn it, it is the first update in a long time with less than 100% increase in net worth, well – it was great while it lasted! Quick change: Now that my wife is working and no longer is a “student” we have to keep $3,000 in her checking account with the remainder kept in Tangerine Savings Account. It includes money that will be required for rent, cell phones, insurance, and minor emergencies. $24,067 in TFSA – Invested in Tangerine Balanced Growth Funds (check your TFSA contribution room). $54,193 both Questrade RRSP accounts (my thoughts on Questrade), invested in the basic 3 stocks couch potato index portfolio. Whenever you have a double digit net worth growth any year is good enough in my books. Also, the second important thing is your net worth trend is on an upward trajectory. As long as these two things keep on going, your net worth will be in great shape. That’s some solid, consistent growth! And it’s good to see you have zero debt and are no longer in red. Thanks for sharing and keep up the good work! Solid growth in a year. Congrats on being debt free. Keep the momentum going. As your net worth increases, the relative percentage change between updates will become smaller, even if the absolute change stays the same or increases. Don’t focus too much on the numbers. Rather, focus on the trend, which is looking great! @SS: Pretty good progress you are making with your net worth! And, more importantly, your liabilities are $0, so you any increase in your assets is a positive to your overall net worth. You are doing the right thing by renting. Mobility will help you explore the best career opportunities available to you and your wife. If later you decide to have kids, maybe owning your house will become more appealing but there is probably better places to do that then Vancouver. I must say that you are making remarkable progress. If you can maintain this trend, you may surpass your goal. That is a great achievement. Keep going! Keep up the great work! You are saving a ton (>50% of salary) given that Vancouver is a HCOL (high cost of living) area. Great that you are tackling debt and saving. Actually I find Vancouver life much cheaper and healthier compared to a suburban, small town, or rural Canadian location. Housing can be expensive but (tax-free) property appreciation and the ability to offset costs with a rental suite more than makes up for the cost of the down payment and allow you to build equity. Mortgage interest payments are comparable to rent. Not having to commute or drive to shopping or activities, or saves a bundle in transportation costs. You can get away with driving the same little car for decades. Utilities are cheap. Vancouver has loads of small produce shops everywhere offering great fruit and veggies cheaper than the big chain grocery stores. You can walk or cycle year round. Just wanted to stop by and say thank you for all the nice comments.